Hazel Clark derives her perspective on fashion education and sustainability from years of experience as an art and design scholar, educator, and administrator. Her work is informed by a sustained belief in collaborative inquiry and an enduring curiosity about the changing role of fashion through time and space. 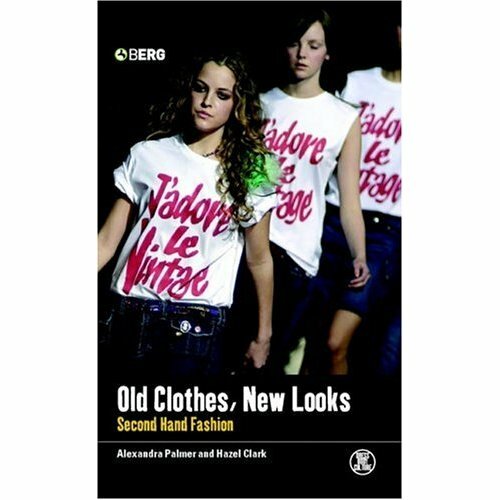 Old Clothes, New Looks (2005) combines the work of anthropologists, sociologists, economists, and art and fashion historians, and The Fabric of Cultures (2009) features an equally diverse roster of scholars (Clark co-edited both titles). It is this bringing-together of disciplines that also defines Parsons’ M.A. Fashion Studies program, which launched on Clark’s initiative in 2010 and now serves as a vital meeting point for thinkers, and re-thinkers, across the expanding field of fashion. Mae Colburn: What does sustainability mean to you, especially within the context of slow fashion, which you describe in “Slow + Fashion – an Oxymoron or a Promise for the Future…?” (2008)? Hazel Clark: To me, sustainability is about trying to establish new parameters of thinking about dressing without excessive waste. We’ve still got to have clothes, and I feel they are a very interesting part of our identity, but that doesn’t necessarily mean that we’ve got to have the excessive waste surrounding them that we’ve become so used to. When I wrote [the article you referred to] in Fashion Theory, it was very much instigated by a one-day symposium that I’d attended in Milan organized by Ezio Manzini, who was then at the Politecnico in Milan. It was a bringing together of people from the slow food movement and design, which I felt provided a very useful way of thinking about clothing. It’s very obvious to think about how we can make changes within old models, but it’s the models themselves that need examining, and using parameters or concepts from one area and bringing them to another can be very helpful. It was just a good way of rethinking longevity, and systems, and communities, and the local. Agency as well – thinking about how individuals have agency over the way they dress. MC: In the introduction to Old Clothes New Looks, you and Alexandra Palmer write that “consumer agency and taste are the final determinations of sales, costs and, ultimately, the fashionability of dress,” which is interesting because we often think of designers are the ones fashioning a more sustainable system. Could you describe that tension? HC: I think that consumers should have agency because they’re putting out the dollars to buy things and I think there is a tension for designers now, certainly with what one might call the do-it-yourself movement (if, indeed, it is a movement), and this recognition that began a number of decades ago that fashion is not just a one-line dictatorial process where the designer is the auteur and has the agency. It’s a myth that designers have total agency; it’s a seductive myth, but it’s a myth nevertheless. Very few designers have complete agency because they work as part of a team. The production of clothing is teamwork, even though in many cases members of the team (pattern cutters, seamstresses, etc.) remain anonymous. The problem often is that the user doesn’t have the sense of agency, or that sense of confidence to dress themselves. It would be wonderful to think of fashion more as self-styling, more about giving people the means to be comfortable in what they wear, to be confident in what they wear, to know their bodies. I don’t think people are completely dictated to by fashion; fashion is so diverse and so multifaceted that one doesn’t have to be, but I think that building a sense of confidence to create an interesting personality with clothes should be considered a part of fashion. There are interesting examples. One company I really like is Junky Styling, in London. They have a service called ‘Wardrobe Surgery,’ where people actually take clothes [from their own wardrobes] and work with the two women who run the company to restyle them. I actually mentioned [Junky Style] once at a conference and I remember somebody saying, ‘oh, but it’s terribly expensive’ – but it’s all relative, and I think that’s the other point about how much one is actually paying for clothes and where the profits are being divided. We’ve got to think about the value factor here. […] It’s only been in the last hundred and fifty years that people have had more than three or four things in their wardrobes. That’s why I particularly like the work of British scholar Kate Fletcher, because she’s talking about these different modes or models one might have for different types of clothing so that you can think strategically about your wardrobe. MC: I wanted to ask you about scholarship in particular. Do you see this moment as an opportunity for a new methodology surrounding dress, one that represents perhaps a more holistic perspective and includes history and theory but also, for example, subjective narratives like oral histories? HC: I think oral histories are important. There’s been some recent scholarship looking at wardrobes, particularly in the U.K., and scholars like Daniel Miller and his student Sophie Woodward, who are coming from a more material culture or anthropological background, are thinking more carefully about relationships when it comes to clothing. I think one of the issues [with fashion] is that it’s so predicated on the visual, on the image (in fashion magazines and now the internet), and I think we’ve got to consider more the sensorial relationships, the materiality of clothing, and also the capacity that clothes have to sustain us, make us feel as well as look good. […] I just co-taught a two-week course, ‘Fashion and Everyday Life,’ a couple of weeks ago with my colleague from the U.K, Cheryl Buckley, a design historian at Northumbria University. It was a graduate class where we had M.A. Fashion Studies students and M.A. History of Decorative Arts and Design students working collaboratively and we encouraged them to, for example, look at their family histories and bring in personal photographs – to talk about their experience of fashion and clothing within the context of the everyday. Thinking about the sorts of qualities and relationships we have with our clothing goes hand in hand with acknowledging continuities and sustainability. It really brings us down to a more involved, intimate level and the recognition of the individual experience, and this is being recognized in scholarship. Sophie Woodward, for example, is not just talking with women about their wardrobes; she’s talking with women in their wardrobes (that is, in the presence of their clothes). One of the first books that Daniel Miller produced about consumption, Material Culture and Mass Consumption (1987) – there were a couple of articles in that book where he talked about the problem of dealing with the artifact, and in this country, fashion historian Valerie Steele has used the work of Jules Prown, a leading scholar of material culture [along those same lines]. We still need ways of thinking about and dealing with the artifact, but I do think it demands scholarly discourses that are more collaborative. This is what we’re trying to do in Parsons’ M.A. in Fashion Studies. We called it Fashion Studies because we’re drawing from a variety of disciplines. Fashion exists outside of fashion design and I think teaching this will lead to more collaborative work by faculty, and also by students. It’s a bit of an open space at the moment, but I think there’s a lot of potential there. Hazel Clark is Research Chair of Fashion, and former Dean of the School of Art and Design History and Theory, Parsons the New School for Design. Mae Colburn is an independent textile researcher based in New York City.